Leeds, UK, 02 August 2016 – After a competitive pitch to raise it’s profile across the UK business spectrum as it heads towards a goal of a £100m turnover within the next 5 years of trading. BigChange has transformed the mobile workforce market with it’s ‘Jobwatch’ system, helping businesses sync back offices more effectively with their mobile teams and delivering tangible business improvements in terms of time management, job management, fuel and fleet efficiencies, and even health and safety environmental footprints. BigChange CEO Martin Port, a past winner of Ernst & Young’s Entrepreneur of the Year Award for Technology and Communications explains « Ours is a fast track business, delivering ahead of the curve already in terms of our business objectives. So to keep that momentum going we need to make noise that matches our results. And this is why we have chosen Frank to help drive the talkability we need and showcase our 3-in-1 revolution for mobile, tracking and back office benefits that firms of all sizes are recognising the need for. 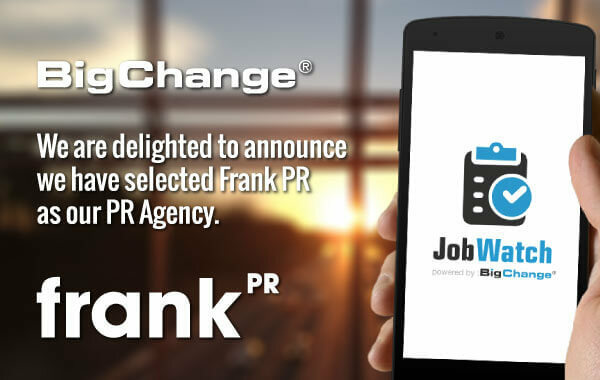 Earlier this year Frank won PR Moment’s Large Agency of the Year award and their client list includes Lord Sugar, Green Flag, Hammerson, Premier Inn, BathStore, and PaddyPower.